This cool completely customizable bracelet, made of 100% recycled scrap materials, gives you the letters and symbols to say it! Make a statement about the planet, your true love or whatever happens to be on your mind. Adjustable cuff easily fits most wrist and ankle sizes. Let your creativity run wild with sets which give you duplicates of the most popular letters plus cool icons so you can say just about anything. Starter Kits are the best way to get started with Shains. This Kit is equipped with a Recycled Cuff and 100 Elements including 75 letters, 10 numbers, and 15 cool icons making it easy than ever to wear your message right on your wrist. Shains are recyclable when you are ready to go and get new ones. 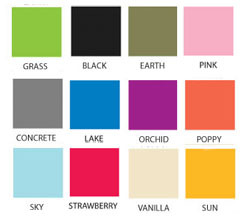 Colors: Black, Sky, Concrete, Sun, Earth, Grass, Orchid, Poppy, Vanilla, Lake, Strawberry, and Pink. S.H.A.I.N.S. (State How Action Is a Necessary Solution): 'say it wear it mean it'.